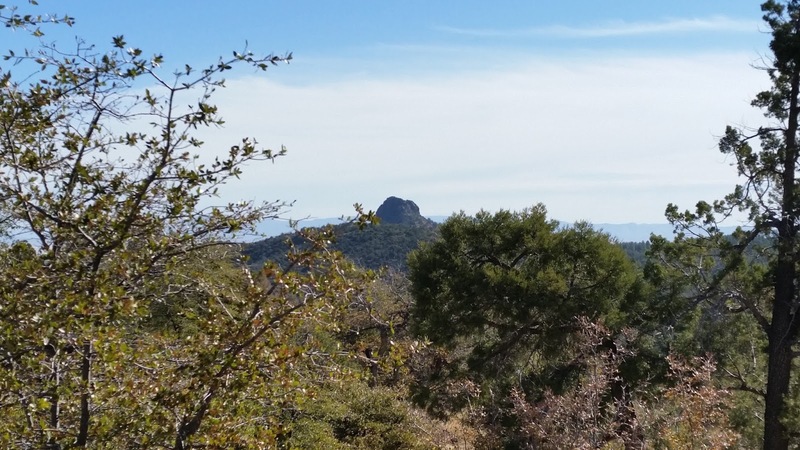 The most prominent feature southwest of the town of Prescott, AZ (Pop: 42,513) within the Prescott National Forest is Thumb Butte, a mountaintop that kind of looks like a thumb I guess. 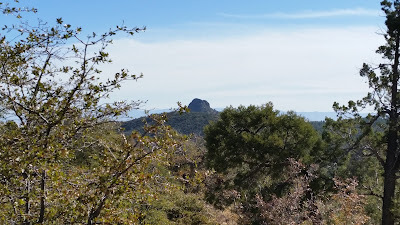 Thumb Butte Loop is a forest road that winds around the Butte in a large circle and there are 21 disbursed camping sites along it. Driving up the Loop many of the sites were either occupied or had a "placeholder" tent or vehicle in them meant to reserve the site for future occupation and use. A camper left in a campsite to reserve it. 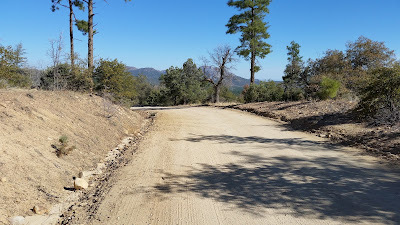 Thumb Butte Loop's road quality varied from hard packed gravel/dirt to really pot holed barely drive able at more than 5 mph. Because Prescott National Forest is a "Wildland-urban-interface" (WUI) campers are limited to only a seven day stay vs. the normal 14 day limit in most National Forest. 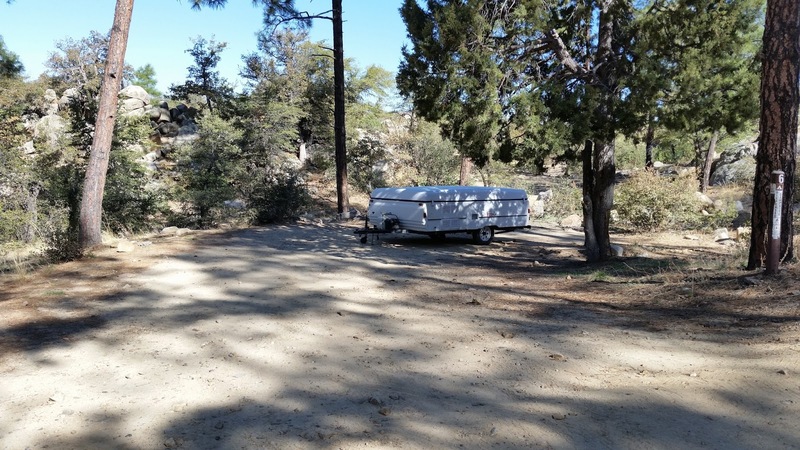 A ranger who stopped by my campsite said the WUI designation is because Prescott is a fairly large town compared to the small towns that usually abut National Forests. 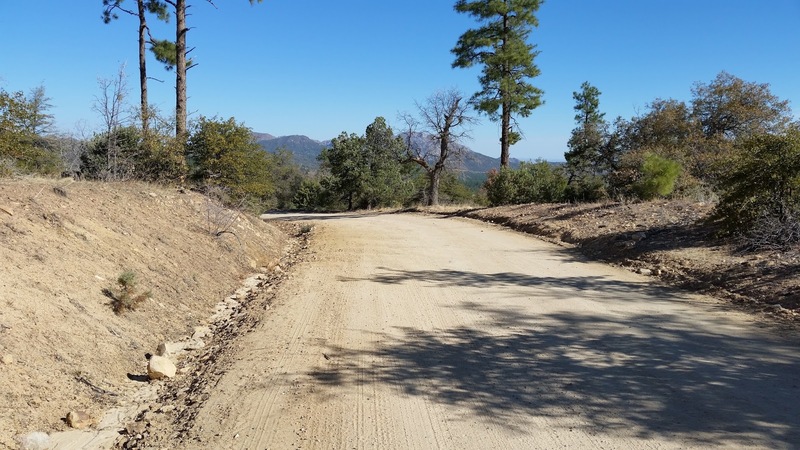 The sites along the Loop, which are designated by metal poles the Forest Service has put up, vary quite a bit in size and big rig accessibility. 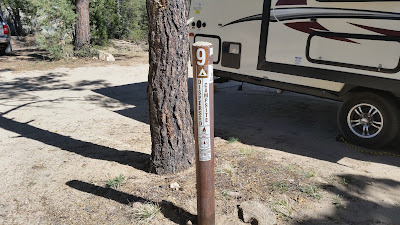 Not that the Mini really qualifies as a "big rig" but the first two sites I tried to squeeze into didn't fit very well but I finally found a suitable campsite at pole 9. 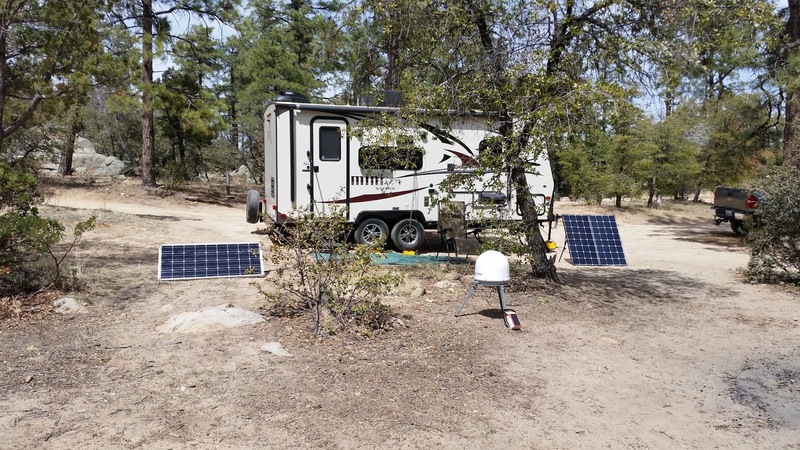 Campsite 9 -- even among the tall pines solar was adequate. Forest Service campsite marker pole. On the way up the Loop you drive past what look like campsites that even contain stone fire rings but lack a campsite pole like the one in the above snap. 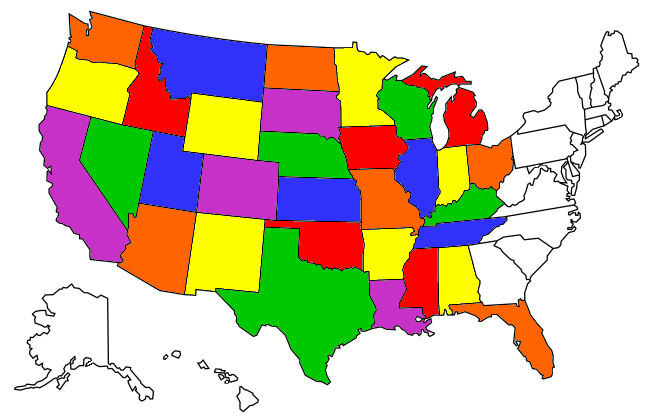 If you attempt to camp in them rangers will evict you and, depending on if it's the weekend or not, you may have a problem finding a legit unoccupied campsite so be forewarned. I did most of my walking along the Loop as it's relatively traffic free at least during the weekdays. There were some paths through the pine trees that in some cases were a little challenging, especially since you're at 6400 foot altitude. Hiking path through the pines. 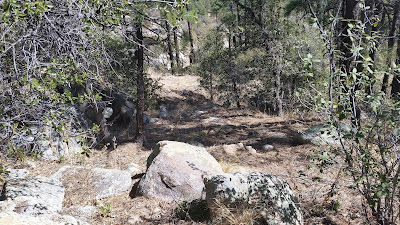 Unlike some of my recent Arizona camping experiences the section of Prescott National Forest that Thumb Butte Loop runs through was virtually litter-free. As you can tell from the photos the weather was sunny and low-80's during the day and high-50's at night -- perfect camping weather! By early April the temperatures in southern Arizona start hitting the 90's, making boondocking without AC challenging, at least during the day. A good way to beat the heat is to gain altitude at camping areas like that along 6400 foot Thumb Butte Loop and I hope to be back again next April!